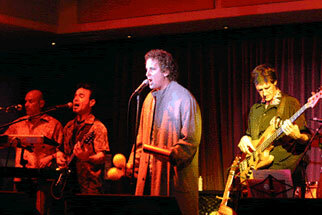 Viva is the original Santana tribute act originating in 1990 in Southern California. The music of Santana has inspired each player to pour heart and soul into every performance and become a link to the master himself. Become a believer and experience the soulful and authentic sound of Viva. The band is fronted by guitarist and vocalist Arnie Vilches, who picked up a guitar at age four and has shared the stage with rock and roll greats such as Cheap Trick, Blue Oyster Cult, Robin Trower, REO Speedwagon, and B.T.O. to name just a few. He has also performed with numerous Christian artists including Phil Keaggy, Margaret Becker, and The News Boys. Arnie co-founded the Viva band in 1990 with bassist Chris Guerra and vocalist/percussionist Tom Connor out of his love and appreciation for the music of Carlos Santana which started in the 7th grade when he first heard Black Magic Woman. Santana has been his biggest musical influence ever since. The band is also comprised of Stan “Tawny” Gonzales on keyboards and vocals, drummer Roy Tamanaha, Mike Manglicmot on timbales and vocals, and Pasquale Buono on congas and vocals.